Notes on a lecture by Murat Arsel, reflecting on the limits and possibilities of environmental struggles against Turkish ‘neoliberal developmentalism’. The discussion suggests that environmental struggles must go beyond localism, towards politicising social, economic and environmental justice in Turkey. In the last decades and especially in the aftermath of Gezi Park resistance, environmental movements in Turkey have received increasing attention by activists and academics. The question of whether the movements can become a leading and uniting force in the resistance against the harsh neoliberal and developmentalist agenda of the Turkish state and whether they might offer transformative, democratic alternatives remain critical issues in the ongoing debates. Murat Arsel, Associate Professor at the International Institute of Social Studies (ISS) in The Hague engaged with these questions during an ENTITLE seminar in November 2014, at the Universitat Autὸnoma de Barcelona’s Environmental Sciences and Technologies Institute (ICTA). His talk focused on the transformative potential of environmentalisms (with emphasis on the plural) in Turkey. Arsel shared his knowledge of several environmental movements in Turkey, always focusing on the role of the state, the actors involved in environmental activism and the political potential of recent environmental conflicts in Turkey. Arsel first discussed how the state has been historically perceived by the environmental movements in Turkey. He sketched-out the relations between class and environmental activism and emphasised what we can learn from environmental conflicts about the specific character of development and modernisation in Turkey. Arsel highlighted the country’s imperial past and traced the strong presence of the state, a presence that continues to be significant. Since the 1950s, environmentalism in Turkey was limited to a-political forms of nature conservation or pollution prevention at best. Environmentalism was a top-down affair, focused on issues like preserving natural ‘beauty’ in forest or coastal areas, educating citizens not to litter, and establishing related institutional legislations and enforcement structures. Following years of state-led economic policies of import-substitution industrialisation, environmental concerns were limited to a mere constitutional ‘right to live in an healthy environment’. Though this ‘right’ was included in the 1982 constitution after the coup d’état in 1980, it was hardly ever operationalised in practice. The modernist ambitions of economic growth and industrial development have long been a priority compared to the environmental objectives in Turkey’s transition to neoliberalism. The environment was considered by elites as a non-political issue and environmental problems were addressed through technological advancements. This techno-managerial approach followed the logic of modernism and a developmentalist imperative by the Turkish state which focused on competition with the West. After the 1980s, Turkey made a rapid leap towards a neoliberal economy. Privatisation of key economic sectors and increased extraction of natural resources lead to the formation of various local environmental struggles in the political scene. Given the a-political phase of environmentalism after the military coup, these struggles however had to settle initially for softer demands, struggling to form a strong position against the Turkish state. Arsel noted that, in a sense, until the 1990s environmentalism in Turkey took place in a setting where actors were working with and through the state. The epoch therefore witnessed limited confrontations between the people and the economic objectives of the state. Although institutionalisation and professionalisation of environmental NGOs had been established by the early 1990s, environmentalism in Turkey was still a minor political activity, not really considered within the realm of politics but composed of activities of mostly urban or semi-urban elite actors. Arsel argued that although they were not necessarily economic or financial elites, many activists actually embodied the state (some of them having been former public servants), in the sense that they did not question the state per se and its role in environmental degradation. Nonetheless, many of the activists felt that “the state is in the wrong hands”. 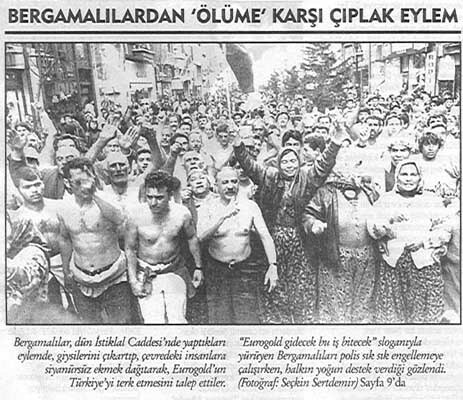 A turning point which politicised environmental concerns in Turkey was the Bergama movement against cyanide gold mining in 1989. Arsel explained the importance of the mining conflict and the evolution of the Bergama movement which transformed it from a local to a national issue. The struggle notably also gave rise to a ‘gendered mobilisation’ for the environment, as women appeared in the forefront of protests, in some cases enabling them to take a more advantageous position in their communities as well. Basing his empirical arguments on cases of environmental resistance in Bergama (against a gold mine), Gerze (against a thermal power plant), Fındıklı (and several others against micro-hydroelectric dams) and most recently Gezi Park, Murat Arsel elaborated how each movement contributed to the current level of environmental politicisation in Turkey. He was skeptical however about the extent to which these environmental movements actually questioned the role of the state in advancing Turkey’s growth-addicted neoliberal political economy. He also raised the question whether these movements can build strong political alliances between each other and whether this might enable a bigger debate to challenge neoliberal transformations and the capitalist system. As mentioned, although Bergama sparked the politicisation of the environment in Turkey, environmental movements usually did not have an anti-state position. In fact Bergama is a good example to show that many movements engaged in a nationalist or anti-imperialist discourse which primarily criticized foreign companies for seeking to extract profits, for instance with their gold mining projects. Arsel also argued that until the Gezi Park Uprising in 2013, most environmental struggles remained local, rural movements, though they occasionally established connections with urban intellectuals and activists. He concluded that while some of these movements were radical (but not necessarily revolutionary) their actors were generally ideologically heterogeneous. Will environmental struggles open the way for political transformation in Turkey? Arsel’s talk was followed by a lively discussion. The audience was particularly interested in how local environmental movements initially came together, how they established links with other rural movements and urban actors, and how they may (or may not) enable a transformative political force struggling for social, economic and environmental justice. The discussion showed that environmental justice requires going beyond NIMBY (not in my back yard) approaches. While earlier examples of environmental movements usually remained local, the Bergama case against gold mining was the first to open up a path towards national claims, visibility and legitimacy of other local movements, towards NIABY (not in anyone’s back yard). This implies that the task is to scale-up localised environmental struggles and to build-up coalitions between environmental movements pursuing different agendas in different areas. Arsel observed that over time the state and its economic elites were effective in convincing the Turkish population that economic growth is necessary at any cost. This way economic growth has become a hegemonic concept that is not easily be questioned by environmental movements under the current political context in Turkey. Although many Turkish environmental movements still hold incoherent positions on economic growth and neoliberal transformation, Arsel finds that they have started to question who benefits from and who bears the burdens of environmental conflicts linked to neoliberal investment projects facilitated by the state in Turkey. Emphasising the successful case of the Gerze movement against a coal-fired thermal power plant (see references below), Arsel argued that environmentalism is beginning to become a vehicle for a structural critique of neoliberal development and the state in Turkey. In his conclusion Arsel emphasised the question of whether the environment can serve as an arena of struggle that may unite various classes and segments of society. The lively discussion ended with important questions on how environmental activism and conflicts in Turkey may connect to others elsewhere, for instance in Latin America. Key here is to work out strategies for building potential international alliances which may empower environmental struggles, by transforming political and environmental subjectivities. *Murat Arsel is Associate Professor at the International Institute of Social Studies (ISS) in The Hague. He works on the political economy of environment in Turkey and Latin America. In 2005 he co-edited a key volume on “Environmentalism in Turkey: Between Democracy and Development?” , together with Fikret Adaman (Boğaziçi University). Naomi Klein (2014) This Canges Everything: Capitalism vs. The Climate. Simon & Schuster: London. *See particularly page 349 for reference to the Gerze movement. Murat Arsel et al. (2015) Environmentalism of the malcontent: anatomy of anti-coal power plant struggle in Turkey. Journal of Peasant Studies.